The milestone is another sign that Apple is positioning itself as the greenest big tech company as rivals like Amazon get pummeled for not having a comprehensive climate change strategy. In a filing earlier this year, Apple said that it considers climate change a risk that could disrupt the company’s operations and that investing in renewable energy makes good business sense for Apple. “A few years ago we said we wanted to start working on supplier clean energy, and our goal would be 4 gigawatts of new clean energy projects up and running by 2020. We’re still on track to meet that goal,” Lisa Jackson, Apple’s vice president of environment, policy and social initiatives told CNBC in an interview. Apple’s own facilities, including offices, stores and data centers, currently run on renewable energy and have since 2018. But manufacturing comprises 74% of Apple’s carbon footprint, and it’s carried out by independent supplier companies who own and operate their own factories. Currently, Apple’s suppliers are buying or generating 1.9 gigawatts of renewable energy, and will have over 5 gigawatts operational by 2020, exceeding its previously announced goal, Apple said. “Four gigawatts is about a third of our energy use, so as we pass 5, we’re moving towards a place where we can say almost half of our supply chain is committed to Apple production being 100% renewable,” Jackson said. In 2016 and 2017 Apple issued $2.5 billion in “green bonds,” which raise funds earmarked specifically for projects that have a positive environmental or social impact. Those funds have been completely spent. 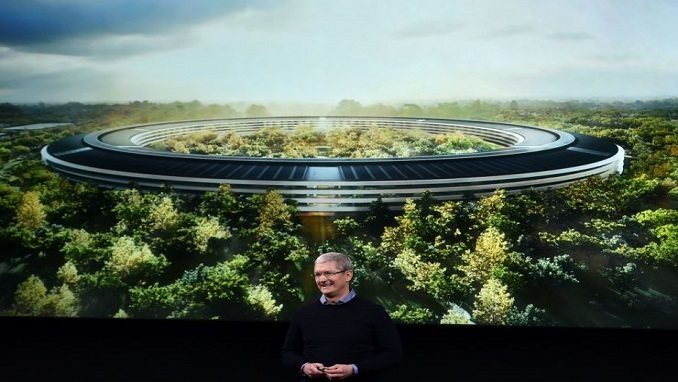 The funds went to 40 different projects, including solar panel installations, wind installations, new recycled aluminum alloys, and environmentally friendly landscaping at the company’s headquarters in Cupertino, California. Apple didn’t issue an additional green bond in 2018 and Jackson didn’t say whether the company planned to issue another. “What we learned is that there is a robust market of people who want to go invest and subscribe to green bonds. What we thought we brought to the market was not only the offering, but also the reporting we have done,” Jackson said, speaking about Apple’s detailed disclosures about how the money was spent.